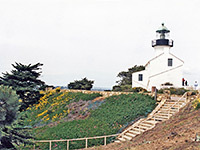 Great views of San Diego Bay, wildflower-covered hillsides, whale watching, an historic lighthouse and tidepools along a rocky coastline are the attractions of Cabrillo National Monument, which covers a small area of less than one square mile near the southern end of Point Loma, a narrow spur of land jutting out into the Pacific Ocean. The monument is little known compared to the large national parks of California but its city location ensures a steady stream of visitors all year. The monument commemorates and is named after Juan Rodriguez Cabrillo, the first European to explore the western coast of the USA - sailing north from Mexico, Juan entered what is now San Diego Bay in September 1542, and rested there for a while before the expedition proceeded up the California coast, possibly as far as Oregon. 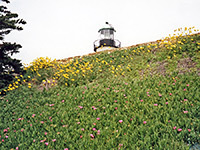 The small part of the Point Loma peninsula occupied by the Cabrillo National Monument is 9 miles from San Diego city center via CA 209 and is bordered by a US Naval Reservation to the north (which contains the Fort Rosencrantz National Cemetery), and a Coast Guard Reservation to the south; the peninsula has been occupied by the military since 1852 owing to its strategically important position. The centerpiece is the whitewashed building housing the Old Point Loma Lighthouse, built in 1855 but in service for only 36 years as its light was too often obscured by fog; a new station was built nearer sea level and proved to be more effective. The interior has been preserved with all original fixtures and fittings dating from the late nineteenth century. The peninsula is a sandstone outcrop rising to 422 feet above sea level. Meadows, bushes and trees cover the flat land on top and the steep hillsides, which are enlivened by many species of wildflowers in spring and summer. Short paths link the visitor center, lighthouse, a statue of Cabrillo and several viewpoints, and a longer (2 mile) trail descends through the shrubbery on the bay side, ending at an overlook, although this seems not to be very popular. Around the center are various displays relating to the natural history of San Diego Bay and the military hardware located at the US Naval Air Station clearly visible just across the waters on North Island; beyond here are the skyscrapers of downtown San Diego and the mountains in the Cleveland National Forest looming in the distance. 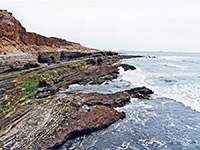 On all sides of the Cabrillo peninsula the hills drop down to rocky cliffs with exposed, angled strata, and sandbanks eroded by wind and rain into unusual formations. The coast on the west side is accessible by road, from where a footpath runs along above the shore, passing several places to climb down to the tidepools, wave-cut terraces, mini caves and pebble beaches along the waters edge. This part of the Pacific lies in the migration path of grey whales, who journey to Baja California and the Arctic Ocean around October and return during January-February. Holiday Inn San Diego-Bayside is one of the closest hotels to Cabrillo National Monument - 5 miles north along Highway 209 (Rosecrans St, Canon St and Catalina Blvd). The inn is a 5 storey building 200 feet from the north edge of San Diego Bay, overlooking the marina, in a generally quiet area close to the US Naval Training Center. It has 237 rooms divided into several blocks arranged around a sizeable garden area containing an outdoor pool, whirlpool, a 9 hole putting course, and many palm trees.